We are committed to abide by the highest ethical and moral principles, and work to develop continuing, mutually beneficial relationships. We collaborate as a team to cultivate a working environment that encourages personal growth, creativity, open mindedness and a positive mental attitude. Our customers will experience the highest value through timely service, superior reliability, and the utilization of well-maintained dumpster rental products. We will continuously be 100% committed in terms of support through both personal and corporate involvement. Above all else, we promise to maintain a friendly environment by keeping our quality, reliability, and customer satisfaction at its very best! There aren’t any tricks – just good old-fashioned, reliable business principles. While others are busy nickel and diming for everything from fuel surcharges to environmental fees we’re busy picking up your rolloff dumpster rental so you can focus on the things that matter. Our company works hard to maintain continuous improvement of our operational processes, and focus on learning and understanding more about our customers. We extract value from the waste stream, and invest in additional lines of business giving you our complete dumpster rental service packages upfront. 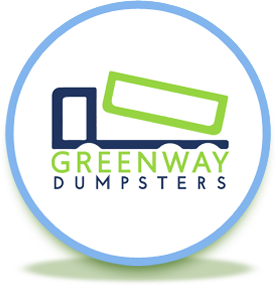 Greenway Dumpsters is a locally owned and operated dumpster hauling company that reliably recycles or disposes of any non-hazardous waste that is permitted by law. Our unique dumpster delivery system allows us to respond to customer’s requests to deliver specialized rolloff style dumpsters. Our dumpster rental system is clean, customer friendly and non-damaging to driveways. With a simple telephone call or email we are able to drop off a rolloff dumpster where and when our clients need it. Our smaller scale, single axle dumpster delivery trucks can fit into areas that no dual or tri-axle dumpster trucks would ever think about. Our customers do not need to be on-site when we deliver or remove the dumpster. Our energetic team will arrive at the door in a clean uniform with a clean vehicle. Customers will be given a price for the dumpster rental service in advance, so there is no confusion. Once the rolloff container is full, they simply call us and we will return at the prearranged time to remove the container.